Enjoy self contained luxury in this architect designed 2 storey vacation rental cottage. 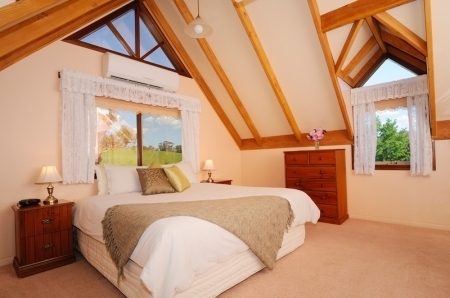 Upstairs you will find a large air conditioned bedroom with soaring cathedral ceilings, a king size bed, and stunning views across the property. Downstairs there is a bathroom with 2 person spa, shower over spa, lounge area with wood fire, widescreen TV/DVD/CD, and a full kitchen with gas stove and a microwave. The dining table is set in a bay window where you can enjoy a coffee or a meal, while you take in the views across the property. This is also an ideal spot to sit and watch the many birds and native animals that share the property with us. Quality linen, crockery, cutlery and cooking utensils are all provided in the cottage. Please note that no smoking is permitted indoors. Discounts apply for a single person, extended stays, and group bookings - please contact us for details. Generous breakfast provisions are available at an additional daily cost of $25 per couple. The provisions include milk, juice, bread, fruit, jam & marmalade, tea, and plunger coffee. In addition we include either a range of cereals, or bacon and eggs.